Terrorist, 23, stabbed passengers on #40 bus on Begin Road. At least 3 are seriously wounded. Suspect shot in leg, caught. A terrorist stabbing attack took place Wednesday morning on a bus in central Tel Aviv, on Begin Road, near Beit Maariv. The terrorist in an Arab man, reportedly from Samaria. Videos taken a few minutes after the attack show wounded civilians receiving first aid from emergency teams. Another video shows the wounded terrorist after his arrest. 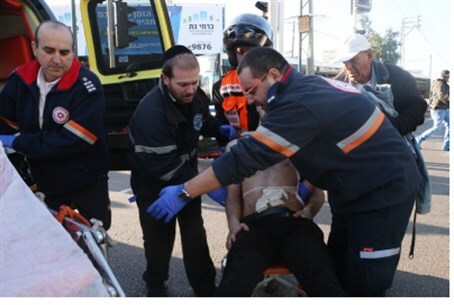 Up to 12 people were reported wounded in the stabbing, with 17 receiving treatment from Magen David Adom (MDA). The wounded were taken to Ichilov and Tel Hashomer hospitals. An eyewitness told IDF Radio that two of the wounded were very seriously hurt, having been stabbed "in the brain (and) in the neck." He said that some of the wounded got away from the bus and advanced about 100 or 150 meters before collapsing. The official police Facebook page posted video footage from the scene of the attack. The stabbing rampage took place inside the #40 line bus. The terrorist reportedly stabbed the driver first, and this prevented the driver from opening the bus's doors to let the passengers escape. The doors were reportedly opened by one of the passengers. He then got off the bus and was chased by police on Hamasger Street. He is reportedly 23 years old and a resident of Tulkarem in Samaria, who was in Israel illegally.